We are adjusting to the fact that we don't always know where soccer games will be---and find out field location just days before we hit the pitch. Which means, this last weekend collapsed into a last-minute trip to Arezzo. (I will say, if learning 'spontaneity' is on your short list of personal goals, this would be a perfect environs for you). It turned out to be fantastic. I rented a car (this simple phrase always cracks me up, as it involves riding a bike across town with out-of-town bags strapped on---and since 6 days a week only registered resident-only cars are allowed to drive into the city---picking the boys/passengers up at a rendezvous point 4 blocks from our flat). 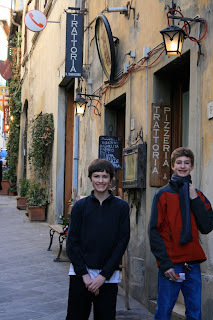 In this case the boys walked with me across town (my bike carrying 3 bags while we pushed it---and took in the sites). So we picked up the car, first went to Caleb's at-home soccer game (Anthony and I poked around Fiesole while Caleb's team warmed up), then packed into the car and drove to Arezzo. More accurately, we drove straight to our country hotel. A good bargain since it was just outside the city. And it was way up a curvy road, where there was still some snow on the ground! We ate dinner at the hotel---a treat above all treats. Then slept, woke, ate a delightful breakfast (a spread of pastries, meats, cheese, homemade jellies, coffee, fruit, yogurt...) and sped off toward Anthony's game. The whole day was sunny and delightful. We hit Arezzo in the afternoon, saw Vasari's house (just the outside---it was closed), toured the Duomo, and sat in the grande piazza for a long lunch in the March sunshine. We Anthony [parla Italiano] had made an appointment to see Piero della Francesca's Legend of the True Cross---apparently one of Italy's greatest fresco cycles (in the church of San Francesco). We also went into an antique-museum of a personal collector whose finances still make Arezzo a better place; he is the reason Arezzo is so famous for its antiques market. Besides the antiques, churches and the food, we loved Arezzo's park. This huge glorious park (with a sculpture of Petrarch) was full of grass, sun, stretches of pathway-lined trees, and stunning views over stone walls. People were throwing balls, sitting about chatting, babies riding in strollers, children running about. People of all ages filled this park to the hilt. All this buzz was right in the heart of the city---the whole park butted right up against the Duomo. And the long streets coursing through the city (Corso Italia & Via Cavour) were people-laden as well. But the thing was---it wasn't tourists. It was the people from Arezzo humming and chatting about. It is a clean city, well-kept (rebuilt and restored since the war---and it shows), cared for and lived in. No graffiti (there is a ton of graffiti in Florence, so we always notice where it isn't); just neat parks, clean streets, good restaurants, inviting piazzas and well-kept buildings (the library and loggias were beautiful). And we find that with most of the cities we visit, we make immediate plans to return. Our next visit will include a visit to Vasari's house, time at the Museo Statale d'Arte Medioevale e Moderna, a lingering visit/picnic in the park---and exploring the ruins of the Fortezza Medicea. So, Arezzo... until next time.